In April of 2017, Amaterra returned to the Seventeenth International Conference on Current Issues of Sustainable Development hosted at Opole University in Poland. the role of technology in building sustainability. The conference hoped to address one of the most important questions: do efforts and actions aimed at sustainable development really lead to sustainability? As a result, Amaterra prepared research and presented on the role of emerging technologies in development and conservation, and their impact on sustainability. In today’s contentious political and economic climate, sustainable development initiatives are being both promoted – as a solution to decreasing funding levels and falling support for international development programs, and undermined – in terms of an assault on scientific methods, anti-climate change rhetoric, and reluctance to innovate because of risk aversion practices due to the same decreased funding. Amaterra’s research focused on the role of emerging mobile technologies to increase the validity, efficiency, and access to data, and the repercussions this increased access has on development programs. Further, Amaterra’s analysis and research explores the particular nature of opportunities presented by these technologies. Ranging from data aggregation through the promotion of new economic opportunities, and production of and access to improved indicators in education and health care. Despite challenges, and weaknesses observed in ongoing pilot programs utilizing mobile technologies, the promise of increased transparency, access, and validity of data offers an exciting opportunity. To not only analyze the direct impacts the technologies are having on sustainable development programs, but also to record and observe indirect impacts they are having through unexpected correlations and synergies across the private and governmental sectors (e.g. the advent of mobile money, and the use of forcasting and trend monitoring in analytics to predict/recognize vulnerability/crises based on financial behavior). These synergies are helping us address the question of if sustainable development programs are yielding sustainability, and how we can utilize emergent technologies to support and enhance these outcomes. The presentations were well-received, and Amaterra’s research and exploratory presentation on the role of mobile technologies and the opportunities and pitfalls they bring with them, particularly in the aspect of monitoring and evaluation within the development world, encouraged deeper conversation. On January 11th, 12th, and 13th 2017 Amaterra’s director David N. Berger collaborated with Andrzej Polus, the president of the Polish Centre for African Studies and an assistant professor at the Institute of International Studies at the University of Wroclaw, to host a panel and present their paper at the Activisms in Africa: Discourses on civil society and activism conference in Lisbon, Portugal. Titled: “Exercises in Activism and Citizenship – Trajectories of Government – CSO’s Relations in SSA.” Focused on citizenship and activism and drew upon an understanding of political and social forces that have shaped civil society and government interaction. It built from the supposition of an ideational structure of mutual suspicion and mistrust that has adversely affected activism to encourage discussion and consideration of this structure and its effects. The panel worked to analyze the evolution of CSOs’ role and position in Sub-Saharan Africa, through the examination of structures that promote development and activism. The panelists were asked to attempt to outline a “map” of CSOs’ positions toward the governments in the entire region. Regional or country-orientated research proposals were also included as they provide vital references on the nature of CSO-government relations. In an effort to map CSOs’ role in activism, submissions that addressed historical, economic, cultural, political, policy-orientated, or even descriptive aspects of the evolution of CSO – government relations, were welcomed and vigorously discussed. Additionally, David and Andrzej welcomed proposals devoted to the evolution of the Sub-Saharan political landscape in times of economic decline as well as those related to relatively new aspects of CSO activism. These included how mobile technologies, wider access to information, and new means of communication and organization encourage mutual transparency and strengthen the social contract between government and citizens. Additional topics that addressed exogenous factors, including aid structures (Western vs. China and the emerging powers factor), political pressure, and economic pressure, were key focal points of discussion. Activisms in Africa, The International Conference organized by Center for International Studies of the Instituto Universitário de Lisboa (CEI-IUL), took place at ISCTE-IUL on January 11-13 th 2017. Fotografia de Hugo Alexandre Cruz. David and Andrzej also collaborated on a paper, which pulled on David’s experience with Amaterra and his time serving with the U.S. Peace Corps in Zambia between 2011 and 2014. Andrzej brought a wealth of experience and passion to the team with his focus on the political economy of hydrocarbon management and the constantly evolving political situation in Sub-Saharan Africa. Andrzej has conducted field research in Botswana, Ghana, Namibia, South Africa, Tanzania, Uganda, and Zambia. Together they wrote “Contention and Mutual suspicion: Civil Society in Zambian Politics.” At the conference, they were able to present research regarding contention and suspicion between civil society and government. The principal aim of their research was to critically examine the relationship of local non-governmental organisations with Zambian governments under the Movement for Multiparty Democracy (MMD), and the Patriotic Front (PF). Their major finding is that relations between the MMD and later the PF government, and advocacy NGOs were characterized by mutual distrust, and mutual accusations of a lack of transparency and legitimacy. The NGOs were mainly employing a ‘name and shame’ strategy whilst engaging the government, which together with the government’s suspicious attitude towards NGOs created a specific ideational structure of mistrust and mutual suspicion. This dynamic has been extremely difficult to break, and is the dominant influence on government – NGOs relations. Amaterra has recently attended the Sixteenth International Conference on Current Issues of Sustainable Development. The conference, titled “Generations for generations – priorities of sustainable development yesterday, today and tomorrow” in Opole, Poland focused on the need for a new perspective regarding sustainability and sustainable development from a generational approach. Amaterra was drawn to the conference due to its focus on generational responsibility for the protection, and maintenance of the environment. The premise of the conference aligned with Amaterra’s mission, in that the environment was positioned as the basis for the subsistence of humanity, but more importantly as the foundation of natural capital from which all other socio-economic processes originate. Protection of that foundation, and initiatives through sustainable development to ensure its health, maintenance and enhancement are key to our future. – challenges for sustainable development in different sectors, e.g. transport, energy, waste management etc. – and the role of technology in building sustainability. On the 25th and 26th of April, 2016, Amaterra’s Executive Director presented on the topic of “Sustainable development and community mobilization – through failure to success.” The presentation was designed to discuss the role of sustainable development, and specifically to address the necessity of a different view and approach to current and future development capabilities, primarily those of more contextual and comprehensive approaches to sustainable development. Approaching development not as sustained growth, but as a holistically sustainable closed system, which would allow for higher quality of life, while maintaining the health of the ecosystem and environment. The presentations were well received, and Amaterra’s perspective on sustainability encouraged deeper conversation and linkages and an invitation to collaborate with new partners and academics. The presentation and resulting short paper were published in the Central and Eastern European Journal of Management and Economics Vol. 4, No. 1, 41-61, March 2016. 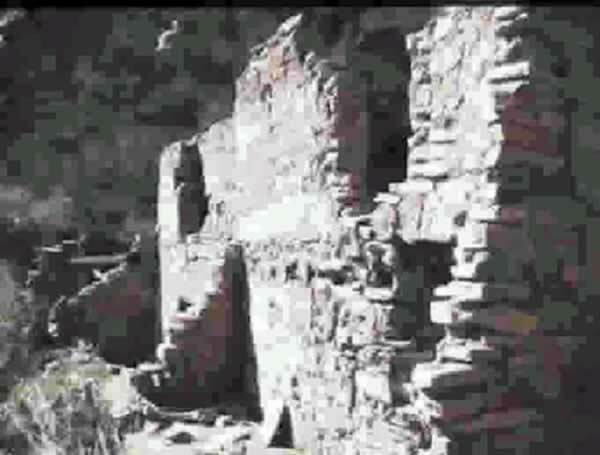 The project sought to document cliff dwellings and other prehistoric sites in the Cherry Creek area of east-central Arizona. In 1995 and 1996, major expeditions were mounted to revisit all of the cliff dwellings and other sites recorded since 1981, and to conduct additional survey work to locate new sites in middle Cherry Creek. Four weeks were spent each fall with dozens of volunteers from all over the world. Over the two seasons, nearly 20 cliff dwellings were fully documented and more than 40 new sites were recorded. The documentation involved completion of more than 1700 forms, 40 rolls of black and white film, and over 20 rolls of color slide film. We now have a great dataset of site condition at this point in time, and learned a tremendous amount about the construction and remodeling of the sites. We also placed long-term temperature recording devices and have thousands of lines of data documenting diurnal temperature fluctuations in the sites and in the canyons. These data show the importance of passive solar heating in the siting of these villages. The Desert Laboratory was founded in 1903 by the Carnegie Institution to further arid lands research. Scientists early on established permanent vegetation research plots on Tumamoc Hill, an 869-acre preserve now surrounded by Tucson city development. Some of these same plots continue to be studied making the Desert Laboratory one of the longest environmental reasearch projects in history. Today the photographs and collections of the laboratory form the basis of understanding of how our present environment is part of a long continuum of desert change. Amaterra provided mailing list soft-ware, helped create a newsletter, and participated in fund raisers to raise public awareness and support for the Desert Laboratory. “This newsletter would not be possible without the enthusiastic support, energy and skills of Amaterra, a non-profit organization in service to the Earth. Amaterra sponsors caretaking projects throughout the Southwest: at Sand Canyon Pueblo in Colorado for over a period of eight years, they cataloged plants and animals, collected meteorological data, and built a field research support facility for Crow Canyon Archaeological Center. At the Nature Conservancy’s Canelo Hills Preserve near Sonoita, Arizona, they restored some of the preserve’s nineteenth century buildings and provided round the clock caretaking for two and a half years. Sand Canyon Pueblo (A.D. 1250) is one of an unknown number of settlements developed in the thirteenth century by the ancient pueblo people in Southwest Colorado. The Pueblo is located at the head of Sand Canyon, a tributary to the McElmo Creek, a few miles west of Cortez, Colorado and Mesa Verde National Park. 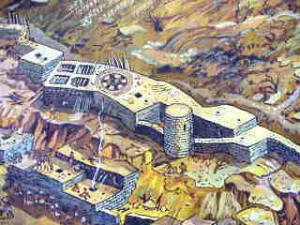 The Pueblo consists of 400+ rooms, 89+ kivas (underground ceremonial structures), 15+ towers, at least one water 1985reservoir, a cliff dwelling, and a D-shaped bi-wall structure and a Great Kiva. Our desire to support the research program of Crow Canyon Archaeological Center in Cortez, Colorado led Amaterra to begin work in 1985. We believed that this work of studying, nurturing, and honoring the past, and the lives of the ancient ones who built Sand Canyon Pueblo, enabled them to have a voice to speak to us about today’s human interface with the environment. Many of our members feel that Sand Canyon Pueblo is a sacred site of great importance to those who built it. Our concern for the Earth and its special places requires no less of us than to treat them with appropriate care, to nurture them, and to touch them in ways of active respect. This was the heart of Amaterra’s presence at the Pueblo. Direct Support- Care of the Pueblo and assistance to the CCAC staff included site security to prevent unauthorized intrusion during the most intense periods of excavation, and the building of on-site kitchen, dining, laboratory, meeting, storage, and housing facilities. Later, by assisting in final landscaping of the backfilled areas of the Pueblo, members helped to hasten the time when the site returned to the state it was in before excavation began. Trail Building- Many trails were built to assist with public interpretation and the prevention of damage to the site. Through numerous such activities members sought to create a harmonious and caring atmosphere associated the the human involvement at the Pueblo. This was perhaps the most important direct contribution of Amaterra to the Pueblo. Plant Studies- Members collected and identified plants in the immediate area of the Pueblo. At one time our on site herbarium consisted of more than fifty species of plants. To assist Crow Canyon Center’s phenology project we made regular observations of the seasonality of a number of plant population in the area. The archaeologists have determined that the particular plants were of interest to the builders of the pueblo. Meteorology- Members built and maintained three weather stations in the area. The main station was located at the Pueblo, the second, in the canyon below, and the third two miles to the west near one of the Center’s experimental gardens. Animal Studies- Members identified forty-nine species of birds and seventeen species of mammals and reptiles at the Pueblo. We published pamphlets describing these animals for visitors to the site. Evening Programs- Through the years, members provided many evening programs for the Center. These often included preparing and serving meals for as many as sixty people. Numerous campfire talks provided programs of interest both to the Center’s staff and to the public. Student Internships- During each of the years of Amaterra’s work at Sand Canyon Pueblo from five to ten student internships were made available to students who were at least eighteen years old. These two week long internships provided full room and board. 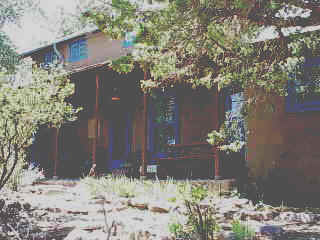 For more information about the current programs and activities of Crow Canyon Archaeological Center. During the spring and summer of 1987 Amaterra began caretaking and restoration of Canelo Hills Sanctuary as a service project for the owner -the Arizona Nature Conservancy. Amaterra’s overall goals were to provide site security, restoration and repair of the historically important buildings, greet and assist visitors, assist in research, and protect the valuable ecosystem. Karen Seger served as project director and liaison between Amaterra and the Nature Conservancy. Under Karen’s leadership Amaterra members were able to provide year round seven day per week caretaking of the property and the maintenance of a an interpretive visitor center for the public. All Amaterra members directly involved with the work of Canelo became members of the Nature Conservancy. Members kept detailed weather records and regularly assisted the Preserve Manager in stream flow measurements. Amaterra completed all of its major goals during the twenty-eight months ending September 1989. In order to continue the work, after this date, several members organized a group named, “Friends of Canelo.” Although, at that time, Amaterra officially ceased its work at Canelo, “Friends of Canelo” continues the work to this day.